Regardless of whether you’re looking to supplement your TV subscriptions, or take advantage of live TV, an outdoor TV antenna can be perfect for you. It will give you a few more channels without the charges, or the trouble of subscribing to a plan. Even signals that an antenna would pick up from far away can be 1080p quality, which makes it an excellent way of keeping to a budget, or having a backup TV source when your other services are down. Now, before you go out and buy, there are some things that you must know. There are a ton of options. To help you with these, we’ve assembled a list of outdoor TV antennas that we have tested and pitted against each other. Most are not the best at everything – instead you have leaders in their own respective categories, range, price, signal type. Let’s take a look at our top options according to reviewers best recommendations. Low on time? Heres a quick roundup of our top 3 picks and why you need them! The 1byone HDTV antenna is perfect for just about anyone, with an excellent range and great bad weather performance. The 1byone is an impressive, high quality antenna with a lot of features to appeal to just about anyone. From the build quality, to the multi-element cross-phase build, it will withstand any tough conditions and perform admirably even in bad weather. In any location we tested it, and no matter how much dirt we throw at it, the antenna just didn’t give up which is where it stood out to other reviews. It was the best performer in situations such as strong winds and heavy rains, and even in snow storms. Reviewers noted signals were picked up with ease and we got the high quality we expected. The range of the 1byone is up to 150 miles. And we aren’t talking about the advertised range – we’re talking about the range you will actually get. This is not one of those promises that manufacturers don’t deliver on. Even when we had stations that were around 140 miles away, in ideal conditions, we could pick up their signal. In poor conditions, the signal quality decreased, as we’d expect, but not by as much as we thought it would. One of the reasons may be the fact that the 1byone comes with a built-in amplifier, one which significantly increases both its range and the quality. Fortunately, that amplifier doesn’t create any noticeable noise, so you shouldn’t worry about it. You’ll be able to receive UHF signals, and it’s optimized for 1080p reception, to make sure you get high quality video. All things considered, this is an excellent choice for the overall top outdoor TV antenna, especially if you want one that works great in foul weather. Yes, we have another outdoor TV antenna by 1byone. This time it’s their amplified mounted TV antenna, which is another high quality outdoor product. As per reviewers it performed almost as well as the other one we spoke about in bad weather, but both of them are made for different things. In terms of receptions, we also found that the other 1byone antenna we spoke about performs better in dense areas, such as downtown Chicago, and in tough natural conditions. However, for the few extra bucks you’ll spend on it, you’re getting both UHF and VHF high-definition reception. It’s optimized for 1080p, but can still receive standard definition signals. The built-in amplifier helps quite a bit, yet makes little to no noise. It’s barely noticeable, and since it’ll be on your roof, you won’t hear it. The advertised 150 mile range is almost true, as we found the antenna working close to that. In good conditions, you can easily get 120 miles of range. In the city it still works great, and many of the received signals are in high quality. The tests we did were more or less in line with the other 1byone antenna, but the range and performance in bad weather was a bit better on the other one. Setting it up is really easy and doesn’t require a lot of work. You’ll get a mounting pole, as well as a J-shape pole for installation, so you have everything you need. Even though it performed slightly worse than the other model by 1byone, if you want both UHF and VHF, it’s an excellent option. It’s durable, it’s high quality, and it still performs admirably as per reviews best in UHF. The RCA Compact Yagi Outdoor HDV antenna is built really well, making it a great choice for people who fear it may get damaged easily. The RCA Compact Yagi is another durability champ. It’s built like a tank, and it withstood all kinds of weather in those two weeks we tested it. In ideal conditions, it easily delivered on the promise of a 70-mile range, which is more than we can say for some of the other contenders. In wind and rain, there was some quality loss, but nothing too serious. Our reviewers ran some of our tests in an area that is fairly hilly, which was no issue – we still had a clear, high quality image of signals that were 50 miles away. In a heavily obstructed area, such as downtown Chicago, it also performed great. Surprisingly, most of the available signals were received in very high quality. The RCA Compact Yagi antenna can receive both VHF and UHF channels, so you’ll get all the channels that you’ve ever needed. Another thing we have to discuss here is the simplicity of installation. The antenna basically comes pre-assembled, so setting it up is as easy as it gets. You also get an easy-lock fold-out UHF reflector, as well as a mast, all the mounting hardware you need, and a 75-ohm transformer. If you’re looking for something that’s compact and works great, and is as simple to install as possible, this is what you’ll want to get. Mediasonic's HW-560AN is a great choice for people who live in areas that don't have a lot of obstructions. For those of you who want something that excels where there is little to no obstructions, you should give the MediaSonic HW-560AN a chance. It’s excellent when you live in the suburbs, or in a city which doesn’t have a lot of tall buildings. The promised range is 60 miles. Even though less than the other antennas we spoke about earlier, it’s still more than enough for many users. We also found that in ideal conditions, you’ll get those 60 miles. However, if the weather isn’t ideal, you might suffer a performance hit. In terms of numbers, heavier winds and rain meant that the range drops to around 30 miles. This is half the range in ideal conditions, which isn’t really impressive. When it comes to performance with obstructions, our reviewers noted the MediaSonic is quite honestly, average. Some of the signals were received with excellent quality, and others were merely average. One thing that should be noted is that you won’t get an antenna pole with the MediaSonic. You’ll need to purchase one separately. However, once you do, setting it up is very easy, and you won’t have any trouble with it. If you’re looking for a budget-oriented solution, live in an area without any obstructions, and don’t need a lot of range, it might be perfect for you. The Antop Flat Panel TV antenna is a small, compact solution with great weather resistance and coatings. The Antop is the first somewhat unconventional design. However, it looks more modern, it looks different, it’s a bit more compact and is certainly more visually appealing. The small, compact design allows it to perform very well when the conditions are less than ideal. To add to that, it has an anti-UV coating which makes it even more reliable. The waterproof coating will make sure that snow and rain don’t damage it, and will shield the signal from interference. These are all things that you won’t find on most other antennas. In terms of durability, all of the features we mentioned above make it one of the most durable antennas reviewed on the list. The compact, square, box-like design works well in this regard, and it manages to outperform its competition when we’re discussing durability. Unlike some of the other products we discussed, the Antop doesn’t come with a built-in amplifier. That’s why it misses the top 3 positions on our list. Some of its power is therefore lost, but fortunately, there’s no hit on reliability. The range remains consistent throughout varying conditions and atmospheres. If you were to use it in ideal conditions, the range of 115 miles is consistent and works great. If conditions are bad, or you have hilly terrain, or a heavily obstructed location, you’re only suffering a minor performance hit. We found the range can drop to about 95 miles, but that’s it. If you want an overall very reliable antenna, regardless of the conditions, this may be perfect for you. It will also look different than everything else, and comes with a couple of features you don’t find with the competition. If you disregard the name, the Pingbingding is a great all-round option with all the necessary features. If you put the funny name aside, the Pingbingding Amplified TV antenna is an excellent all-round performer. To begin with, it has a promise of 150 miles of range. Our reviewers found that in a hilly area, with ideal conditions, you’ll get around 110 miles. However, that range is very consistent, and considering the hills, fairly close to reality. Once the weather stops being so perfect, it becomes just average. The range can decrease a bit, to around 85 miles, but it stays there and the quality is still consistent. The other benefit of the Pingbingding TV antenna is the installation. It comes with a mounting pole in the box, which allows you to raise the antenna, and significantly eases the process. If you’re looking for an overall performer, but you don’t need it to excel at one specific thing, you’ll be more than happy with the Pingbingding. Decent range, decent performance, and a decent price, you get everything. The ClearStream 2V HDTV Antenna is somewhat pricey, yet a really good performer in densely populated areas. If you’re prepared to spend a bit more, the ClearStream 2V is an excellent option for you. It has an interesting design, somewhat different, yet performs really well in certain situations. If you’re living in a location that’s less than ideal, with a lot of obstructions, this might be the solution you’re looking for. The antenna has a directional design. This allows it to not only receive the signal from the source it’s coming from, but also to receive signals that are rebounding off of the obstructions. If you live in a densely populated city, this results in a much better signal quality. On the other hand, if you don’t have too many obstructions, and live in somewhat of a close range to the stations, you’ll get an advertised range of 60 miles, and get somewhere around 55. In ideal conditions, this is close to the promise, which is fairly good. What’s surprising is that the antenna performs great in heavily obstructed areas, even though it has no amplifier. This is very likely thanks to the directional design, which means it does work really well. One downside, and the reason why it is so low on our list, is the performance in bad weather. The range and quality significantly decrease – we’re talking bad picture and a range of 35 miles. Fortunately, this only happens in rural areas. We had no issues in downtown Chicago. Overall, our reviewers note it’s not the best solution for someone who lives in a rural area. But if you live in a city with a lot of buildings and obstructions, you’ll be hard pressed to find one that’s better than the ClearStream 2V. With the Antennas Direct High Gain Bowtie TV, you're definitely paying a bit more, but it is worth it for many. Even though it’s priced a bit above the other options on our list, the Antennas Direct High Gain outdoor TV antenna will be more than worth it for most of you. For that extra price, you’re getting a lot of reliability and performance. For starters, the promised range is around 60 miles, with claims that it could go as high as 70 miles. We found that in ideal conditions, the average range is around 55 miles for a HD signal, which is close enough to the advertised range. In bad weather conditions, though, it does drop a bit. When you have rain or strong winds, you could be limited to around 40 miles, and you’ll also suffer a quality hit. This isn’t surprising, though, as the majority of the outdoor TV antennas do have this issue. If you’re looking for a good performer but you don’t need insanely high range or a bulletproof construction, this option could very well be ideal. In city conditions, it works great, and the obstructions don’t really mess with it too much. The Philex Amplified TV Antenna is a compact, circular device with 360 degrees of reception. Another unique design, the Philex has a compact, circular design. This lets it get 360 degrees of reception, regardless of where its pointing. Given that many of the antennas we spoke about only pick up a signal from one specific location, this is very helpful. If you want to watch channels that are broadcast from different sides, the Philex allows you to do so. In terms of design, it’s smaller and looks better than the “regular” outdoor TV antenna. The anti-UV coating protects it from bad weather, and allows it to perform better if that does happen. Installation is very easy, and you’ll get a 33 feet coaxial cable in the box, which lets you put it in a higher place so you can get a better reception. The Philex also has a built-in amplifier which does do a lot to improve performance. Noise is imperceptible since the antenna is outside, and you’ll barely notice that it’s there. In terms of performance, you’ll notice it, since you have a promised range of 65 miles, with the realistic number being around 49 to 50 miles, depending on the conditions. However, the image quality is absolutely great. One thing to note is that some signals can have a lower quality than others. This is simply due to the fact that you don’t have the exact same obstructions and conditions on all sides, and that is a factor. On the other hand, if you’re living in the suburbs or a rural area, you’ll find that it works really well. Bad weather doesn’t really do much to hurt the signal or range, and you’ll get a lot of signals from it. 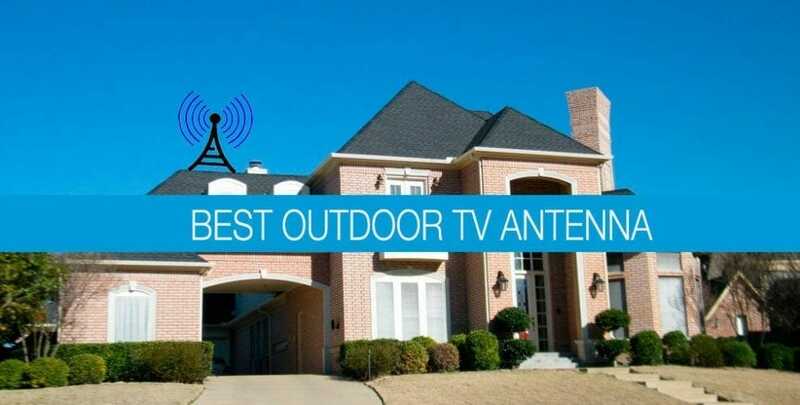 This may very well be the best omnidirectional outdoor TV antenna on our list. Another great option, we have the GE-29884. It comes with an interesting design that’s really simple to install, and a promise of a 70-mile range. You can set it up in a few different ways, whichever you find works best for you, and has a durable build that will last a good while, regardless of the conditions. One thing that we have yet to see with any other product is the weather resistant mounting bracket. It is a part of what helps the antenna withstand bad weather conditions. It also adds to the reason why bad weather did absolutely nothing about the signal quality or the range. To further improve the signal strength and deal with any dropouts, you have signal enhancing reflectors that do make a difference. We tested them, and they improve the overall range, as well as the reception quality, even though not by a huge margin. In ideal conditions, the reception is actually fairly good. We received most of the signals we had available in our rural testing location. We had more or less the same results in a hilly location, but the antenna doesn’t perform as good in downtown Chicago. It’s not made for signal reception through a lot of obstructions. So, if you need it for rural areas, or for a city that doesn’t have a lot of obstructions, the antenna actually performs really well. If, however, you want something for highly populated areas, you may want to look elsewhere. Last but not least, we have the ANTOP. It’s another very high quality directional antenna that is very much worth the higher price tag. It’s compact, it looks sleek and modern, and works very well. Setting it up is a breeze – just about anyone can do it, regardless of how “handy” you are. One of its best traits is that it doesn’t look like a typical device– many people can’t stand that look, and this one is great. To begin with, the ANTOP does have a fairly strong amplifier. It’s not as quiet as some other ones, but it’s still fairly imperceptible since the deviceis outside. It does play a big role in the range and quality of the reception, and so does the anti-UV coating which helps in bad weather. While we’re at it, the device performs great in bad weather. The promised range is around 65 miles, and we consistently got around 55 miles, which is good. If the weather is bad, the range did not decrease too much, which is a sign of a quality antenna. This is another 360 degree device, which can receive signals from just about anywhere. This is very convenient. To add to the convenience, you can use the antenna with two different TVs without needing any kind of adapter. If you have more than one TV set at home, this will come in handy. Overall, a solid performer. Our reviewers testing consisted of over 20 hours of testing from our professional reviewers (mainly Joe as our expert), for over 20 antennas. Each antenna was set up in two very different situations. One was in downtown Chicago, and the other was in a rural part of Illinois. They were set up as good as possible, and we made sure to test everything, from range and reception, do durability and signal quality. We tested in various environments. Aside from what we mentioned, our reviewers also did tests in mountainous regions, flat plains, or very hilly areas. We wanted to be sure that we have just about every variable covered in our tests. The tests were also ran in ideal conditions, as well as in rain storms and strong winds. The tests were run with and without amplifiers. We wanted to make sure that the promised ranges were something that the manufacturer can deliver on. We found that downtown Chicago has a lot more channels and signals available than the rural area. This is simply due to the fact that you have a lot of stations and signals that are coming from all around. However, many actually came with very bad quality, which isn’t something to brag about. A lot of obstructions are present in such a situation, so it’s somewhat expected, but still. Our testing told us that using an amplifier gives you more channels. You also get a bit more in terms of quality, because the signals are picked up much better. However, this isn’t always the case, because some stations simply send out low-quality signals. The results may vary greatly in your specific area, so take our measurements and results with a grain of salt. Last but not least, a more powerful, longer antenna does make a difference. When compared to using a less powerful device, one that’s longer and has more power will give you more channels to choose from, and you’ll get them in higher quality. If your already this far you dont really need to read about the benefits of a TV antenna but just in case you do we have a guide here. How do you choose an outdoor TV antenna? Even though we did give you a few really great options, making an informed buying decision requires that you know what you need, and how you’ll use it. Therefore, we’ll talk about a few of the factors that may affect how usable an antenna is to you, personally. The first thing you’ll want to know is the location. Whether you’re in a rural area, or a busy city will make quite a difference. You’ll also want to know what the weather is like, as well as be wary of your surroundings. Hills and buildings will mess with your signal quite a bit. While we’re at the location, make sure you know what stations are available in your signal range – this should tell you what channels you can expect to see. Next, you should know what you need it for. Different antennas will come with different features and strengths, and with that you’ll get a varying range as well. Some will work best at short ranges, while others go up to 150 miles. Make sure you know how you’ll use it – where you live and where the stations are will dictate the purpose. If you’re in a suburban area, a mid-range receiver should do the trick. If you’re in an urban, city area, a short range device that doesn’t have an issue with obstructions will work best. There are some receivers that can pick up signals from any side, or 360 degrees omnidirectional antennas. For cities and urban areas, these are great as you don’t have to choose which side you’ll be receiving the signal from. As we just said, different locations will get different signals and channels. As you change your location, the towers and channels change as well. Before you get an antenna, make sure you know what channels you’ll be getting. You don’t want to pick one up and be disappointed because you didn’t get the channels you were hoping for. This is another crucial factor. It’s not just the advertised range you should be aware of. You should have a good understanding of your surroundings and geography, as they’ll affect your antenna’s range. If you’re in a hilly area, that’s interference and will decrease your range. If, on the other hand, you live in a flat place or on top of a hill or mountain, this gives you better range. While we’re at it, you should be able to receive the signals of the channels you want to watch at the best quality possible. There’s bound to be some quality loss, so you should make sure you grab as much of the signal as possible. An amplifier is more or less standard with just about any decent outdoor TV antenna. It will make it easier to receive signals when you have a lot of interference, such as buildings or hills. However, even if you don’t have any obstructions, an amplifier can’t really hurt. Where it really shines is when you have a long-range antenna. It will make things even better, especially if you have a new subdivision being built next to you. If you’re more than 20 miles away from the broadcasting station, it will make a difference. This applies to folks living in rural areas – if you are one, get an antenna with an amplifier. An amplifier will also strengthen the signal when the weather is bad, so that’s another benefit. However, if you’re in ideal circumstances, close to multiple stations, and you know there won’t be any rain or wind storms, you may do without one. That’s the case with people who live in condensed areas, and don’t really need a too powerful antenna because the stations are close to them. How do you determine which channels you get and with what kind of quality? Quite a lot of factors can impact your range and the quality of your reception. Whether it’s the terrain, the weather, the atmosphere, or the antenna itself, you can get wildly varying results. There are also different locations that offer different TV stations, as well as different TV stations that vary with their quality. On both ends, there are a host of factors that must be ideal to get a perfect image. To begin with, the TV towers that are available in your area will have the most impact. There are different towers in each area, and they emit different qualities. The common consensus is that the more towers you have in range, the better. It does depend on the signals that they give, but commonly, more towers give you more signals to receive. How far you are from the towers is also crucial. This is why in some situations, a long range TV antenna is very important. The signal drops quite a bit as you get further. You could remedy this with an amplifier, but even an amplifier will only do so much. Next, you have the terrain. It’s another big factor, because certain types of terrain, such as hills or forests, can act as big obstructions. Such terrain will impact both the range, and the quality of the signal you’re receiving. The weather is another big factor. Strong winds, rain, snow and ice storms can have a huge negative impact on your reception. Such situations cause quite a bit of interference, and the only way of combating this is getting an antenna with an anti-UV coating, which isn’t all that impacted by the weather. Last but not least, if you live in the city, this is another factor that impacts what signals you’ll get and how. Just like hilly terrain can be an issue, tall buildings and other obstructions commonly found in cities will also interfere. They’ll block the signal, making it harder to get to the antenna, thus dramatically reducing quality and range. Can you improve your outdoor TV antenna's signal? When you’re buying a antenna, you surely have some kind of expectations. If you don’t get what you expected, the reception strength, the direction, or the weather are only a few of the things that might be impacting this. Fortunately, there are a few things you could try. The first and simplest one is to get an amplifier, if your device doesn’t have one. As we mentioned above, it will positively impact the signal reception, as well as the range. In the end, you’ll be getting signals from a bit further away, and the picture will be with a higher quality. Next, you could try changing your coaxial cable. A longer cable improves the coil, which in turn improves the strength of the signal. If you can, try to make a semi-loose coil between your TV set and the antenna itself, you should see a notable improvement in quality. Last but not least, you can play with your antenna’s positioning. Your Device should be pointing towards the stations you want to receive. Having it point towards a random location and hoping you’ll pick something up just won’t work. Putting it on a higher place also helps, as it will decrease the interference. If you aren’t satisfied, try one of these things, or you could try to reposition it altogether. Experimenting is a bit boring, but it’s the safest way of getting the best signal. Why should you opt for an outdoor TV antenna, and not an indoor one? There’s one word that answers this – placement. An outdoor antenna doesn’t have to go through the walls that an indoor one does, which means less interference from the start. Furniture is another obstruction the outdoor TV antenna doesn’t have to deal with. Then you have the fact that an outdoor antenna is placed on a roof – it’s higher, therefore it’s above most obstructions. Receiving signals without interference is much easier like this. Last but not least, there’s the noise of the built-in amplifier. If its inside, you’ll hear it constantly and it will start to bother you eventually. Having it outside will make it imperceptible. Is installing an outdoor TV antenna difficult? Absolutely not. However, different outdoor TV antennas have differing installation processes and designs. Most of them can be easily explained, but you’ll want to take a look at the included manual for step-by-step instructions on how to install the device yourself. On the other hand, if you can’t install it yourself, or you just aren’t sure you want to try, there’s always the option to get a qualified professional to help you. Or, you could just read a good in-depth guide on installing outdoor tv antennas. Or you could always test your skills and make one! Overall, the 1byone HDTV outdoor TV antenna takes the win. Even though it's somewhat expensive, and only receives UHF signals, it's still overall the top outdoor TV antenna. It comes with excellent range that doesn't diminish completely in bad weather, as well as great build quality. An outdoor TV antenna is an amazing way to save a few bucks. You may thing it’s a complicated thing, but it really isn’t. If you want to watch free TV, or just add a few channels to the ones you have at your disposal, you should definitely check out the antennas we mentioned above.